Published May 25, 2012 By Anna T. This post may contain affiliate links. Regardless, I only recommend sites I've researched and/or used and trust. You know those little text ads you see on most websites? There is actually a way to get paid for writing those! And yes, this would be pretty easy writing because the text is very short, usually not more than 30 to 40 words. 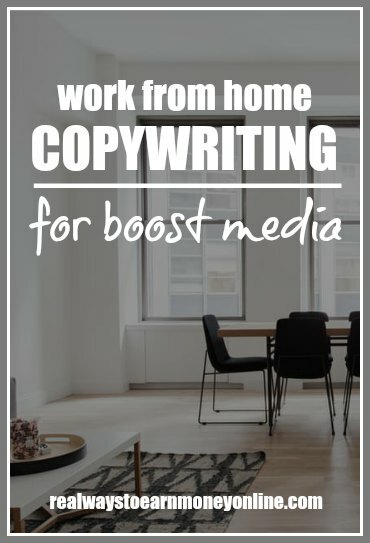 A site I stumbled across a few days ago called Boost Media will let you apply as a writer for these ads. However, this is actually more of a crowdsourcing thing than a work from home writing job. After applying and being accepted as a writer, you log in and search for ad-writing contests to enter. You'll be given all the information you need to write a good ad if you find one you think you can do. According to the website, “Advertisers have the option of accepting, rejecting or modifying every ad submission. If your ad beats the performance of the existing ad, then you are paid the stated contest prize.” So you are competing with others to write the best ad for people/companies that need ads written. In addition to these ads you write for contest submissions, there are also “instant pay” ads that pay around $4 (the contest ads pay much more more than that if you win, around $25 to $45 apparently), but after digging through their site I can't find much information about these. However, I have applied and if I'm accepted, I can come back and provide more details. If a certain advertiser really likes your writing, he/she can select you to participate in private challenges that pay out more than other challenges do. Boost Media will pay you with Paypal for your ads. They do pay every week, but only US dollars are available. Related: FREE list of 200+ writing niches to consider! As stated above, I went through the application process a few days ago. You have to take a short test where you pick which ad out of two given would win in one of their contests, and then you have to explain why you chose the way you did. They stress being very detailed in your explanations. They state before you take the test that their need for writers fluctuates and that they can afford to be picky in who they approve, so I have no idea if I'll actually get in or not, but I hope so because I'd really like to try this and see how it goes! And then of course provide more detail here. You are asked about your copywriting experience when you submit your app. Unfortunately the drop down box doesn't have an option for no experience. You have to select at least one year. But if you've ever written any content that was kind of salesy in nature then this would count as some experience. How much can I earn with Boost Media? A lot! Boost Media offers its writers the opportunity to generate a consistent and potentially a significant revenue stream while working from home. Our on-demand model allows writers to have the flexibility to choose their own hours, assume projects at their choosing, and the ability to work from any computer with access to the internet. The potential to generate revenue can vary greatly depending on writer’s experience, efficiency, quality of reported ads, writer’s grade, etc. You can do so here. I have applied myself, and I'll report back on my experience if I am accepted. Update – I have been writing for this company. Read about my experience writing for Boost Media. Want to Go Into Business For Yourself? This is the most profitable route to take as a freelance writer. You can get your own clients and set your own rates, which you cannot really do with Boost Media. A six-figure income is not outside the realm of possibility when you're running your own business. Not sure what sort of writing you'd specialize in if you worked for yourself? I recommend grabbing a copy of Gina Horkey's FREE list of 200+ writing niches to consider! She's also written an incredibly detailed guide on working for yourself as a freelance writerif you're interested in getting a lot more information on how to go about starting your own freelance writing business. How long it took to approve you? I can’t believe this company started in 2012. I signed up in September, 2014, did very little, then was in a real bind for cash as the year was coming to an end, so I began writing 50+ ads a day. In 2015 I made over $40k. The problem is that they lost many big customers, so work is much harder to come by. As this month rounds out I’ve made about $900. it keeps coming up with error user not authorized messages. It gets annoying. Thanks so much for writing this great post about Boost CTR! I have experience creating Google ads, so I hope this works out for me. Like Victoria, I’m also interested in searching for more sites like this. Some days, I prefer to write a few words than lengthy articles. Anna, whatever happened with this? Did you start work with them? If so, how do you like it and what can you share about it? Thanks! Also, do you know of other copywriting sites? This post has piqued my interest because I don’t like article writing, but I do like short copy pieces. I’ve always wanted to delve into it more and would love additional information. Thanks, Anna, for all that you do! No unfortunately I don’t, but I am on the lookout for more. I love writing these short ads too! Hi Victoria! I have been using BoostCTR pretty regularly just within the past week. I absolutely love it! I can say that it does take a little while (sometimes a week but usually less) for the advertiser to approve the ad. And then it takes another several days after that to get your pay. But they do pay as I have been paid so far. Also, writing the ads is a bit intimidating at first, but it’s not as hard as it seems. The best advice I can give is to look at the way other Google ads online (the text ones) are structured and use that as a starting point. They all have a headline followed by one or two more lines for the description and then an URL at the bottom. It’s very important that the keyword that advertiser wants to use is included. There is a bit of a learning curve, but once you “get it” you can do the ads fast and easy and the vast majority of mine have been accepted (the $2 ads, the high-dollar contest ads are harder to get approved because there’s more competition I’m thinking). Make sure you read over all the writer resources Boost has included on the site. This will help you better understand how to write good ads. Thanks for sharing! I just signed up!